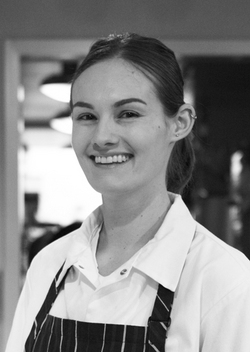 I was very surprised to learn on Twitter that the talented chef de cuisine of ~BARBACCO~, Sarah Burchard, was leaving the restaurant. Aw heck, our city loses another female chef. We had a chance to catch up on the weekend, and she said it was a very hard decision, but she was just “wiped out and taking some much-needed time off.” Burchard was quick to say there was no ill will or conflict—she just needed a break. She mentioned she’ll be doing lots of traveling (she was looking into Paris flights where we spoke), spending some time with her family, and then figuring out what’s next. (You might see her helping out her boyfriend Spencer O’Meara at Paragon events in the upcoming ballgame season.) Her replacement is reportedly a sous chef from St. Helena’s Martini House, and executive chef Staffan Terje will be closely training and overseeing him. 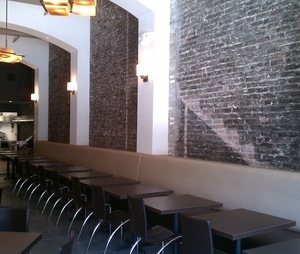 Photo of the old interior from Rose Pistola. How many drinks people have had at that bar… Photo via Facebook. I literally got this news minutes before my post time, so here are the salient points: ~ROSE PISTOLA~ is reopening on Wednesday February 16th. There is an updated interior by original architect Cass Calder Smith, and a re-worked menu by new executive chef Mark Gordon (Terzo, Rose’s Café); Pablo Estrada remains in his position as chef de cuisine—he has been in the kitchen since Rose Pistola opened in 1996. New items on the menu include an expanded sandwich menu at lunch, and a daily baked pasta at lunch and dinner. 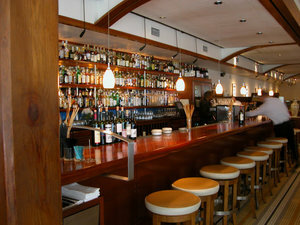 New manager Lisa Robins (formerly Rubicon and Marché) will collaborate on the wine list with Mark Gordon. 532 Columbus Ave. at Green, 415-399-0499. 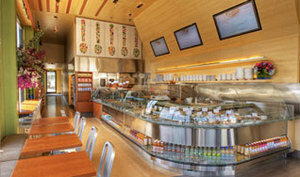 Ebb & Flow interior photo from Yelp/Daniel G.
Looks like the corner space (doubling as a revolving door) at 18th Street and Guerrero is back on the market again—owner Bill Clarke of ~MISSION BEACH CAFE~ has withdrawn his plans in that location (unfortunately one of the primary investors fell through). Clarke is going to continue his quest for a new second space and investor. (Looks like the former tenant’s moniker Ebb & Flow was an apt one.) 598 Guerrero St. at 18th St.
As of today, ~SPIRE RESTAURANT &AMP; BAR~ in SoMa has temporarily closed for renovations and re-concepting: “We mainly want to make the space more comfortable, where our guests can sit and hang out.” They expect to reopen after the end of March/April, which is when the ballgame season returns. Interested parties can follow their progress on Twitter. 685 3rd St. at Townsend. Yelp photo from Kevin Y.
I received word yesterday that ~BISSAP BAOBAB~ will be relocating around the corner to where Bollyhood is now, on 19th Street, and will be able to provide live music and entertainment. Owner Marco Senghor is buying the new location, and anticipates the changeover will all be happening in the next 90 days or so. 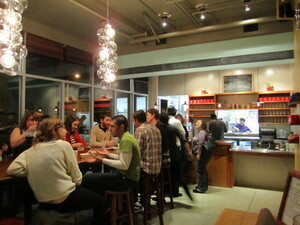 Until the move, Bissap Baobab will be open for business as usual, Tue-Sun 5:30pm-11pm. 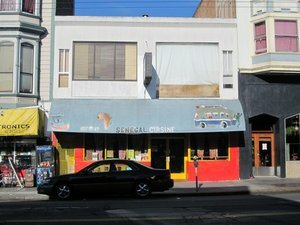 2323 Mission St. at 19th St., 415-826-9287. Now open in the Opera Plaza Center is the previously mentioned ~2G JAPANESE BRASSERIE~ from Jason Tsuji. The executive chef is Hidetoshi Nambu, trained in Japan (he came to America with owner Jason’s grandfather to open a restaurant in San Francisco over 30 years ago), working with executive sushi chef Sasaki Masaki (best name ever). A look at the dinner menu reveals starters like chawan mushi and hamachi kama (yellowtail collar); along with a variety of sushi and nigiri (plenty of unsustainable fish choices in there, from ankimo to salmon to unagi); and an array of tempura ($2-$5) and yakitori, including some more outré picks, like horumon (beef intestine), sweetbread (“top of beef neck”), and tontoro (pork neck), along with more known skewers like soriresu (chicken oyster), negima (chicken thigh and scallion), and kawa (chicken skin), all $3-$8. As for the brasserie-influenced dishes, there are some picks like lamb chops, short ribs, and other fusion-y dishes ($18-$33) that definitely made me raise an eyebrow. The breakfast menu is also chock full of “I’ve never seen that before” dishes, like eggs Benedict and uni (although I would try matcha French toast). Parking validation is available for up to one hour, anytime after 4pm. Open Mon-Thu 7am-10:30pm, Fri-Sat 7am-12am, Sun 7am-10:30pm. 601 Van Ness Ave. at Golden Gate (Suite F in Opera Plaza), 415-292-9997. Dining room photo by Paul Dyer. This Sunday February 20th, ~TWENTY FIVE LUSK~ is launching Sunday brunch from 11am-2pm. Some dishes on chef Matthew Dolan’s menu include a twist on steak and eggs, with braised short ribs, two organic eggs any style, and marinated tomato salad ($14); smoked trout with pickled onion relish, wild sturgeon caviar, brioche, and dill emulsion ($13); pancakes with Vermont maple syrup ($11); and duck confit scramble with yellowfoot chanterelle, baby spinach, fromage blanc, and dried cherries ($12). Or, you can have a smoothie if you’re trying to watch your figure. And there’s a full bar, so some hair-of-the-dog cocktails can be yours. This might be the one time you can visit the restaurant without having to deal with the velvet rope. Laurel Village location; photo from Beautifull! One of my tablehopper readers noted that the Gold’s Gym Castro’s Power Up Cafe was gone, and a new (and third) location of ~BEAUTIFULL!~ was taking its place. 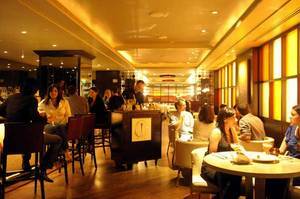 Grub Street has further intel, saying it hopes to open within a month. 2301 Market St. at Noe. It’s hard to find anything wrong with this deal: come to the bar/lounge at ~FIFTH FLOOR~ and you can get a burger, a shot of Buffalo Trace bourbon, and a Lagunitas IPA for $25. The burger is served with Comté cheese, bourbon-braised onions, and a spread that’s made up of tomato syrup and aioli. This particular combo will be available Mon-Sat 5pm-10pm until the end of March, when the pairing will change. How to Score a $5 Pizza and $5 Margarita: Through Facebook! 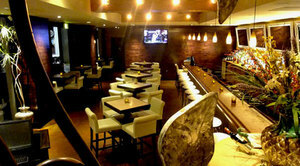 The bar area at Maya; photo from Maya. A couple Facebook offers you should “like”—anyone who likes ~RISTOBAR~ on Facebook can enjoy a pizza for $5 (normally $10-$12 each) anytime from Sun-Wed. during the month of February. 2300 Chestnut St. at Scott. And on Tuesday February 22nd, National Margarita Day, ~MAYA RESTAURANT~ in SoMa is offering any of their signature margaritas for $5 all day in the dining room to their Facebook fans and Twitter followers. Guests just have to show on their mobile phone that they are a fan/follower to receive the $5 price. Maya will also be hosting their “Tequila Tuesdays” tasting series, with Tequila Centinela from the Arandas Valley in Mexico. $10 includes three large tequila tastings, a margarita, and bar bites from the menu. 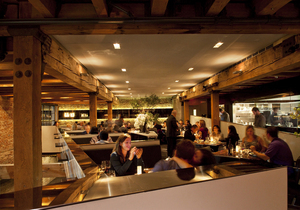 Reservations are not required, but are recommended and can be made at 415-543-2928. The tasting begins at 6:30pm. 303 2nd St. at Harrison. 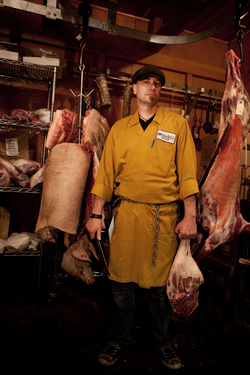 On Sunday February 20th, David Budworth, aka “Dave the Butcher,” is presenting a second annual Evening of Butchery and Belgian Beer at ~LA TRAPPE CAFE~ in North Beach. Dave will be joined by Chris Arentz, trained by Dario Cecchini in Panzano, Italy, along with Josh Kleinsmith from Piedmont Meats in Oakland, and Zach Gero from the Shopper’s Corner butcher shop in Santa Cruz. Dave and Chris will each be breaking down a hind quarter of locally pastured beef in their respective personal styles illustrating the butchering differences between the States and Italy. There will be a set menu of Belgian, Italian, and U.S. beef dishes created by Dave, Chris, and chef Fai Visuthicho of La Trappe. All menu items will be paired with a Belgian beer. Tickets are $120 per person, and include a range of appetizers and beer. Limited to 40 people. Buy tickets. 3pm onward. 800 Greenwich St. at Columbus. 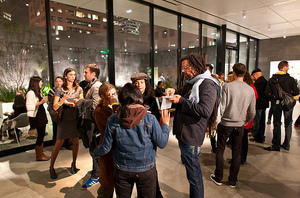 Photo from SFMOMA by Chris Brennan. You can read about the SFMOMA: Now Playing exhibit and performance that evening here, which runs from 6pm-9:45pm (there will be two performances, at 7pm and 9pm). Cavallo Point cooking school photo by Kodiak Greenwood. 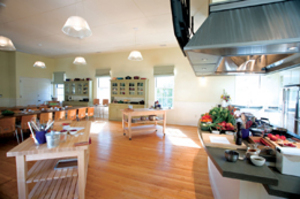 Just across the Golden Gate Bridge, the ~COOKING SCHOOL AT CAVALLO POINT~ is hosting some unique classes, including In My Kitchen: Ayurvedic Journey to the Soul with Nalini Mehta on Saturday February 19th (1pm-5pm), $125 plus tax; and on Wednesday February 23rd, it’s SF Food Cart Wednesday with Azalina’s Handmade, a hands-on class featuring some incredible-sounding Malaysian dishes, like Rendang Ayam (Marin Sun Farms chicken cooked with cinnamon and star anise). 6pm-8:30pm, $65 plus tax. For those of you who sometimes wish my family would adopt you, you can come to ~PURCELL MURRAY~ this Saturday February 19th for an event with Rosetta Costantino, of the recently released cookbook, My Calabria, Rustic Family Cooking from Italy’s Undiscovered South. The afternoon will include demos, conversation with Rosetta, and tastings of recipes that include polpette di melanzane (crispy eggplant “meatballs”), pan-fried sausage and broccoli rabe, potatoes and artichokes served with roasted lamb, and torta di noci (flourless walnut cake). $45. Call 415-330-5557 to reserve your space. 11am-1pm. 185 Park Lane, Brisbane. 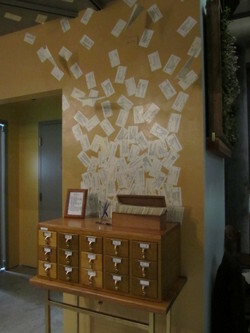 This is where frequent buyers will store their cards; photos by Daniel Azarkman. And now, an East Bay report from tablehopper intern Daniel Azarkman: It sounds like a foodservice fairy tale. ~HOMEROOM~ started as a conversation at a café between two people who didn’t know each other all that well. Though Erin Wade had worked as a cook in New York and Allison Arevalo kept a popular Berkeley-based food blog locallemons.com, neither had been on the administrative side of a restaurant. The pair felt strongly about the importance of locally-sourced cuisine, while agreeing on the need to make it more accessible. So, they thought, what could be less pretentious than mac and cheese? They put together a repertoire highlighting different California cheeses and meats, and began by peddling their stuff from booths at events like the SF Underground Market. 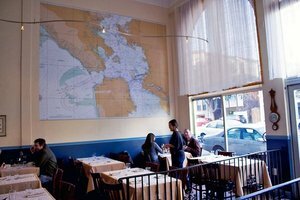 Meanwhile, they found a run-down space in Oakland and put their husbands to the task of building tables out of salvaged wood from Sequoia High School (architects Merites Abueg and Keith Morris may have helped out with the interior as well). The result is a whimsical nod to the American classroom aesthetic, complete with a chalkboard menu and a library catalog for storing your frequent-patron card. After a hectic year, Homeroom will finally open for lunch on Tuesday February 15th, and will start serving dinner once they feel all is running smoothly. The owners held a pre-opening party on Saturday to thank the neighborhood for putting up with them, and to give people like me something to write about. I sampled three dishes that were surprisingly different considering they were all mac and cheese. First there was the Trailer Mac with an uncharacteristically complex cheddar, bits of Niman Ranch hot dog, and crumbled potato chips. The Mexican Mac came in an assertive chipotle-jack sauce, with loose chorizo from nearby Star Meats, chopped cilantro, and a lime wedge. My favorite of the night, though, was a riff on the Roman dish cacio e pepe—perfection with little more than a sharp pecorino and some sharper cracked black pepper. The cacio e pepe is February’s featured Exchange Student, Homeroom’s one chance a month to bring in a special cheese from abroad. These and seven other baked pastas in béchamel (vegan and gluten-free variations among them, using quinoa pasta and a gluten-free roux) will be on the opening menu, along with a few vegetable sides, salads, and homemade sweets. Aside from the grown-up flavors, the menu breaks away from your nostalgic childhood standards in suggesting a beer and wine pairing for each mac dish. All beverage options are local, and most are produced on a small scale, like the Boeger tempranillo and Drake’s hefeweizen. There are even a couple of beer-based concoctions like ‘The Professor’ (half Pilsener, half lemonade), and a beer float using the super-bitter Old Rasputin Imperial Stout and Three Twins organic ice cream. For now there aren’t any chairs at the bar, which they’re also using as an overpass and a cashier stand, but single diners (and drinkers) can enjoy a seat at the rather large communal table. Open Sun-Thu 11am-9pm, and Fri-Sat 11am-10pm. 400 40th St. at Shafter, Oakland, 510-597-0400.